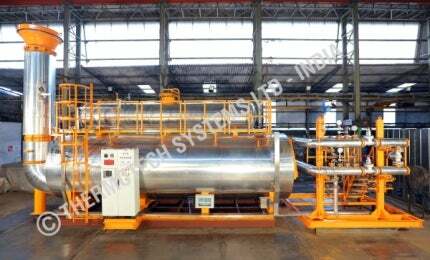 Thermotech Systems is a leading manufacturer of process heating equipment and turnkey industrial solutions. The company supplies products in a variety of industries, including oil and gas processing, chemical, wood working, rubber processing, textiles, paint, food and drink, pharmaceutical, leather and vinyl, paper, automobile and printing. An eco-energy company, Thermotech provides its clients with complete process heating systems and related ancillaries. The company is one of the few in the world that offers integrated solutions in the energy and ecosystem management sector. All heating products run on oil, gas and solid fuels. Recent projects undertaken by Thermotech include the installation of three 6MKcal/h crude oil-fired hot water generators for an Iraq project by Norwegian firm DNO. In 2008, the company has commissioned 10MKcal/h thermal heater in a fully automatic, coal-fired plant in Turkey, which was the first of its kind to be manufactured by any Indian company other than Thermax. ThermoTech was recently awarded an order for two 10MKcal/h high-temperature, thermal fluid heaters for Vegetable Vitamin Foods (VVF) in Taloja. These are scheduled to start operations in July 2015. The company is currently installing eight 5MKcal/h high-temperature, hot air generators for Indian Farmers Fertiliser Cooperative (IFFCO) in Gujarat, India. ThermoTech recently supplied a 1MKcal/h water / glycol / hot oil bath heater for an engineering, procurement, construction (EPC) company in Dubai, in addition to a 1.5MKcal/h crude oil heater for oil refinery in Sharjah, and an 11MKcal/h high-temperature, hot water generator in fully automatic biomass-fired platform in Sri Lanka. Thermotech collaborates with consultants for detailed engineering of specialised projects, pipeline engineering and major structural work of complete systems. Thermotech Systems is a leading engineering company steered by technology and values. Through continual quality compliance with ISO 9001:2008, the company has been recognised for its quality management services and improved product quality. The company has manufacturing facilities in Gujarat and a marketing service network across India, with offices in Delhi, Mumbai, Indore, Chennai, Bangalore, Hyderabad, Calcutta and Rajasthan, as well as channel partners in Turkey, the UAE, Sri Lanka and Bangladesh. Thermotech has exported products to countries such as Sri Lanka, Bangladesh, Nepal, Kenya, Nigeria, the UAE, Saudi Arabia, New Zealand, Turkey, Iraq and Russia.